"It's all about the connections"
Root rot is a disease that causes a considerable amount of damage. It is caused by a lack of the proper amount of lime in the soil. When too much fertilizer gets to the roots, it can make the roots more vulnerable and prone to the root rot as well. The picture on the left is of mature pea plants who have fallen victim to root rot. 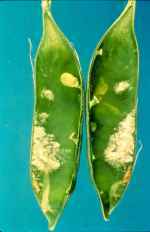 Downy mildew is another factor that can affect the development and yield of P. sativum. Mildew is only treated by keeping the plant off of the ground and lifting the leaves so that air can circulate around, drying the ground and keeping the plant leaves drier. The picture to the right is of pea pod which are affected by the downy mildew and were most likely not lifted off the ground to increase the air flow and circulation. Occasionally spots may appear on the pea pods themselves. These spots are due to organisms growing inside the pea pod. They can be controlled by reducing the moisture in the plant and developing good air circulation around the plant. 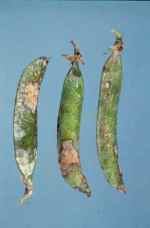 The picture to the left shows pea pods that have been affected and not treated. 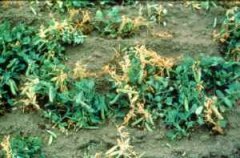 If left untreated these organisms can cause massive amounts of damage and can drastically reduce the yield of edible pea pods. Another issue can be pea aphids. Aphids are generally green in color and are soft-bodied. Aphids feed by inserting their long stylet into the plant. When they enter the plant they enter a single cell (a sieve cell). Aphids feed on the sugars produced by the plant because the cell they enter is part of the phloem network of transporting sugars. By entering the sieve cell the aphid collects the desired sugars, which causes the pea plant to lose some of the sugars and nutrients it had just produced. In areas where aphids are prominent they could produce a major problem. The population of aphids should be monitored because they can reproduce relatively quickly. Aphids can reach maturity in as little as 5 days. 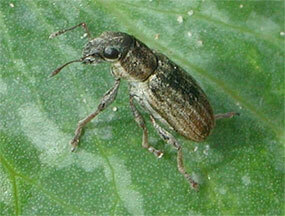 Pea weevil is another issue for pea plants. Pea weevil is a beetle like bug that is 5 mm long. The adult forms feed on the pollen of the peas and the female will lay her eggs on the developing pea pods themselves. The larva, once hatched, will enter into the pea pod and feed on the seeds inside. Picture seen on the right. Animals also affect pea plants. Rabbits and birds, such as starlings and black birds, can cause damage to crops of garden peas. There is no really beneficial way to avoid the invasion of a garden by rabbits or birds. Legumes, like Pisum sativum, have developed a unique mutualistic relationship with the bacteria Rhizobium. The bacteria will enter the roots of the plant and form small growths called nodules. Inside the roots, the bacteria will benefit by receiving carbohydrates and other organic substances in return for fixing (or converting) the nitrogen.